Mother’s Day is a great holiday to go above and beyond to show moms how much they are loved and as a nanny, you have the wonderful honor of being able to help children do something extra special for their moms on Mother’s Day! Here are several ideas of things that not only will make mom feel the love she deserves, but can be fun, hands-on activities with the kids as well! Ask the kids what mom’s favorite snacks and foods are and have them help put together some yummy options for her! Parfaits make for a great breakfast choice and they are easy enough for kids to make themselves, adding in her favorite fruits, nuts, and granola. Is there a brand of cereal they know that mom enjoys? Crunch up some of her favorites for a yummy gift that is tasty and thoughtful (and the parfaits are something the kids can enjoy with her too)! Another easy meal that doesn’t require any cooking is a salad. A lot of the same fruits and nuts that mom might enjoy in her parfaits can also make great fixings on a salad! Find out what other toppings and which dressings she loves and make a robust Mother’s Day brunch that is a breeze to put together. Is mom known to have a sweet tooth? Make some heart-shaped cookies similar to ones often made around Valentine’s Day, and after you bake them, the kids can get involved in decorating them with frostings and M&M’s or other candies. Mom is sure to enjoy these sweet treats made with love. Another creative way to use the heart-shaped cookie cutter is by making some of mom’s favorite sandwiches and cutting them into cute Heart Shaped Sandwiches. A fun way to tie the whole meal prepping idea together is to put these loving treats into a picnic basket and give her a nice option to have some quality time with the children, enjoying the sunshine together outdoors as a family, and without having to prepare a thing herself. This is a good opportunity to put a note to your mom boss from yourself in the basket as well! Kids love hands-on crafts and activities, so instead of helping them get a store-bought Mother’s Day card, assist the littles in making homemade cards out of different colored papers and glitter. Easy and fun flower designs using washable paints is a creative way to gift a Mother’s Day card made with love. Have the kids write a personalized message to mom, or help choose some inspirational poems or bible verses about the importance of mothers. And since a bouquet of flowers is also a nice Mother’s Day gift on its own, turn that into another fun, money saving hands-on activity with the kids by making Paper Flowers out of coffee filters. Usually the best gifts are the ones that are the most personal, and nothing warms a mother’s heart more than hearing her child say, “I love you”. Record a video of her children telling her how much they love her, why they are thankful for their mother, and surprise her with a heartfelt message. 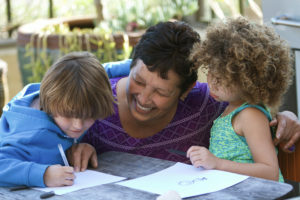 If you have access to some family photos, you can make a fun activity with the kids as well, picking out their favorite pictures of them with their mom and record them explaining why they chose the pictures they did. Being a pivotal part in a mother feeling her children’s love this Mother’s Day is a wonderful way for nannies to play yet another important role in the lives of their dear children and show that you care as well. Happy Mother’s Day to all the moms out there!